Above: An obviously disappointed Amanda walks off Court Central after a heartbreaking loss. Amanda was two games from her first Grand Slam final but was unable to hold on as Iva Majoli won a three-set nailbiter. In the final set, Majoli was able to break Coetzer in the first game and held to go up 2-0 in the deciding set. Coetzer, though, won the next three games, including two breaks. The key game in the match may have been the sixth, as Amanda blew a 40-love advantage that would have put her up 4-2. Majoli came back to tie 4-4 and held serve to go up 5-4 and after each player held serve one more time, Majoli broke Coetzer for the fourth time in the set to win the match. Neither player was able to maintain serve well as Majoli broke Coetzer 11 times while Coetzer answered with nine of her own. There were no aces in the match and both players failed to convert more than 40 percent of their first serves into points. Seven of the 12 games in the third set were won via break, including four by Majoli. She converted 11 of 23 break points while Coetzer made good on nine of 26. "Before the match, I didn't know how I was going to feel because I had a really bad cold yesterday and today," said Majoli. "I couldn't sleep all night. I was on medication. I could hardly breathe." The 19-year-old Majoli was victorious in her first appearance in a Grand Slam semifinal and was the first Croatian woman to reach a Grand Slam semifinal. Q. Amanda, you must be very disappointed, lose a match that was that close. Can you pick out anything that made the difference between the two of you today? AMANDA: Well, I think Iva started off really well. I thought she was hitting the ball very well, very deep, very heavy. I was dropping my shots a little bit short, gave her a lot of opportunities to really hurt me. I felt really happy to have lifted my game a little in the second, given myself at least an opportunity to stay in the match, at least have a chance to still go for the third. Q. Towards the end of the match, her head was dropping. You seemed to be perhaps at your strongest. What happened in that last game? It just fell apart. AMANDA: Well, I think there were two close points, if I remember right. I guess we had one really tough game that I felt pretty disappointed to lose. I think it was at 4-All, both those games. I felt like I had a chance to win those. Probably just got a little bit too worried about those and gave her a chance to get her confidence back. Q. Amanda, this is a first for you, to be at this level of a competition. Is it different psychologically at all in terms of how you took the match, knowing what was at stake? Do you think that had anything to do with the fact that maybe you weren't as free with your strokes as you might have been? AMANDA: I'm sorry, can you repeat that? Q. Do you think it had anything to do with the fact that you had so much at stake, that you would have liked to play 100% today? AMANDA: I think there's a lot on it. That's maybe why it made it a little easier in the second set because all of a sudden I was a little bit more relaxed. I decided to really just go for my shots a little more. If she's too good, she's too good. I feel she played really well that first set. I wasn't making a lot of errors. I wasn't there, and she was just playing too well. Like I say, once you don't have that much pressure on you, probably it's a little bit easier. Q. Three semifinals, three defeats. What does it take to make the extra step? AMANDA: You know, just the right opportunity, I guess. This was obviously not meant to be and I'll keep trying. Hopefully, I will get another chance. If not, what can you do? You can just keep trying. I believe -- I hopefully will have another opportunity. I'll just keep competing. Q. How long does it take you to pick yourself up after a defeat like this? AMANDA: Well, I think I have a lot to be positive about for these two weeks. You know, I had some really tough matches. My one against Conchita, my match against Conchita, I was almost out of the match. I got out of that. I had another great match with Graf. I think I can really walk away from this and feel really good about it. I don't think it will be too much of a letdown. Q. Amanda, who do you like in the final? AMANDA: It's tough to say. I don't want to step on any toes. Those two have had pretty close matches, I think. I'll probably go with Hingis, I think. Q. Can you tell me what it is from your point of view that makes Hingis special and sets her apart? AMANDA: I think she's just got great anticipation. She never seems to be in a lot of trouble. Really good balance. She can get out of shots. She makes it looks easy. I think this last year or so, I think she's played up the court a lot more, she's come in a lot more. She puts a lot of pressure on you. When I played her, I felt like she's really moved the ball around really well. Q. Amanda, this will be on Martina again. The last game of her match against Monica, she played a serve volley point, which she did quite successfully. I was wondering how good a player she would be if she starts playing that way more often, given that she seems to be fairly difficult to beat now? AMANDA: I think the way she's been doing it right now is probably the best. I don't think she should really do it too much. I think just the way she's been doing it, it's pretty good. She chooses the right time to come to the net. It all happens naturally. I don't think she should be the type of player that is going to force it and do it every single point. Q. Does it feel like you're playing a 16-year-old out there when you've played against her? AMANDA: It's been a while, but no, I don't think it does. She's very smart on the court, quite mature, very confident. Probably doesn't seem like a 16 year old. Q. Iva was clearly physically pretty wiped out at the end, pretty spent. How did you feel? How much more could you have played, do you think? AMANDA: I think I could have gone a while. I was hoping to stay in it. Once you get to that point, obviously there's a lot of adrenaline. I think both of us could probably have gone a while just on that. Coetzer Crushes Steffi Again, Reaches Semifinals at Roland Garros! 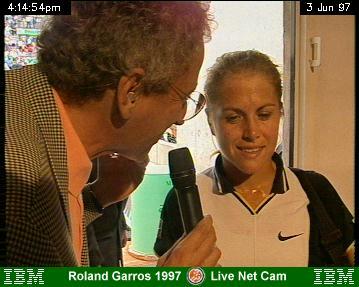 Above: Amanda can't contain happy grin after defeating Graf, then walks off the court to be interviewed for TV. 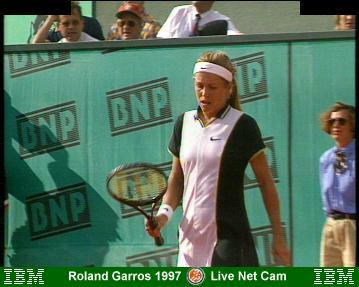 Amanda fought off a late second-set challenge from Graf to reach the semis at Roland Garros for the first time in her career. Coetzer has now beaten Graf in three of four matches in 1997 and will play ninth seed Iva Majoli of Croatia in her second straight Grand Slam semifinal. Martina Hingis plays Monica Seles in the other semi. 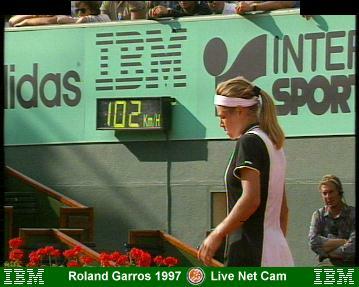 This marks the first time since 1986 that Steffi has not reached the semis in Paris. After cruising through the first set, Coetzer had a 3-1 lead in the second set before a 46-minute rain delay. When action resumed, Graf broke Coetzer in the ninth game to pull within 4-5. However, Graf was unable to capitalize on four chances to get back on serve. After hitting a backhand into the net to force the first matchpoint, Graf hit a forehand return long to conclude the 92-minute match. "I think I felt like she (Graf) was starting to play a lot better (at 4-5 in the second set)," said Coetzer. "At the same time, I was willing to stay out there as long as it was going to take. It was getting pretty tight." Coetzer broke Graf's serve three times en route to winning the opening set in 36 minutes, and six times in 19 chances overall. Graf committed 64 unforced errors and won just 44 percent of her first service points. 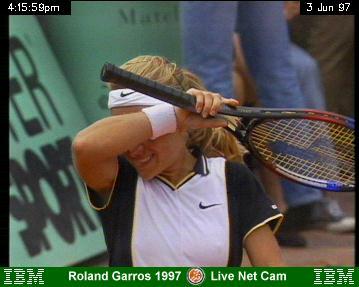 "It was a terrible match," said Graf. "I was really nervous starting off the match, making a lot of mistakes, feeling very uncomfortable, unsure of my shots. I didn't seem to find the reach or the patience at all." Coetzer became only the eighth player to defeat Graf at least four times, joining Gabriela Sabatini (11), Arantxa Sanchez Vicario (8), Martina Navratilova (9), Chris Evert (6), Seles (4), Jana Novotna (4) and Jo Durie (4). For Graf, it was only the fifth time in her career that she has dropped at least three matches to one opponent in the same year, the last time in 1994, when Sanchez Vicario beat her three times. The most times Graf has lost to the same opponent in one year was 1985, when Chris Evert defeated her five times. Q. Amanda, did you feel it was important to stop her from getting back to 5-All? AMANDA: Definitely. I think I felt like she was starting to play a lot better. At the same time, I was willing to stay out there as long as it was going to take. Definitely, I was sensing that she was starting to play a lot better. It was getting pretty tight. Q. She said she's lacking confidence. First of all, can you understand why that would be? Can you sense that in her game? AMANDA: Yeah, definitely, you can sense it right from the start. I can relate to it. I think she hasn't played as much as she would have liked to. Obviously, she has had a few losses against me. If I was in her position, I wouldn't have that much confidence. She's had some injury problems. I don't know how good she is, if she's 100% physically. I can really understand it. Q. Amanda, first of all, can I see what it says on the back of your T-shirt? AMANDA: "Without Control." Pretty appropriate. Q. Last game, Steffi serving 30-Love, long corner to corner rally, what inspired you to hit a backhand dropshot from the baseline? AMANDA: I don't know. I thought to myself that was a little bit risky. It was such a tough point, I don't know what I was thinking. I guess, just a bit of luck maybe. Q. I can remember quite clearly what you said going into the match at the US Open in 1994, that you thought you were able to beat her. Then after the match, after you lost 6-Love, 6-2, you were completely devastated. What has changed since then? AMANDA: Wow, I can't remember saying something like that in '94. Maybe '95. Sorry, what was your question? What has changed since then? Q. What has changed since then? AMANDA: I think my game has changed a lot. I think when I beat her in Toronto, I think she was really surprised because she's always beaten me really easily. I don't think she ever thought that I have the game to hurt her. But I think I've worked on my game a lot; I'm hitting the ball harder. I don't think she can do that much with my shots anymore. Q. After the tournament in Budapest, you said this season you must study earlier. Is that the reason you're playing well now? AMANDA: I think so on the clay. I wasn't feeling so comfortable on the clay. Last year I don't feel I played enough on the red clay. I think it's definitely a good decision. That tournament gave me a lot of confidence because it was my first one and I did well. I feel really happy. I made a commitment to come over to Europe early and play a lot. I think it's really paid off. Q. Do you think you will be bogey woman for Graf? Q. Bogey man, scaring you all the time. Could be? AMANDA: If you want to call me that, I'll go with that. I'll be the bogey woman (laughter). Q. Bogey woman, you've gone into your fourth Grand Slam semifinal? Q. What have you learned from the other two that might take you one step further this time? AMANDA: You know, it's the same thing. I mean, go out and compete as hard as I can. Obviously, it's a big opportunity. You know, there's nothing more I can do. Q. You beat her on a very, very hot day in Melbourne. You were obviously in better condition than anyone else. You beat her on a rather raw day today. The rallies were tremendously long. Has there been a real upsurge in your conditioning during the last 12 to 18 months? AMANDA: Definitely, I think it's taken two and a half years or so to get to this level. You know, I feel technically good. I know I can stay out there technically, but also physically. I know can I stay out there as long as it takes, even on clay, during a match that obviously the points are really long. I feel I can really stay out there. Q. Having beaten Steffi three times this year already, what is the secret? Is it just to keep the ball in play, wait for her to make the mistakes? Have you figured it out? Have the other players figured out what her problem is? AMANDA: You know, I don't think there's one secret. Obviously, I think she's not playing -- probably not playing her best tennis right now, the few times that I've beaten her. I just have to go out there and compete and work really hard. I know she's probably going to go for a few shots that she shouldn't. That's it. I try and play the best possible game that I can, keep the ball deep, keep a lot of pressure on her. Hopefully she'll go for a bit too much when she's not quite in the right position. Q. Amanda, you've come in this room four times previously this last week or so. You have consciously tried to look almost as blank as possible, almost like you were fearing to show excitement. Can you tell us what you're feeling right now? AMANDA: Just what you see, I guess. I'm feeling very, very happy, extremely happy. Like I said, we made a big commitment to try and do well here at the French because I haven't done that well. I felt like I really could. My game is really good for claycourts. I feel extremely happy. You know, it's not over yet. I'm just getting ready for my next match, slowly starting to focus on my next match. Q. Amanda, you said it's taken two and a half years to get to this level. Did you believe at the start when you began this change in coaches, began this sort of training, that anything like this was possible? AMANDA: No, I don't think I did. You know, I had a lot of faith in Gavin. I don't know exactly what he was thinking. I put a lot of faith in him. I was really willing to do whatever he told me and see where it can go. Q. Do you sometimes feel that people are a little demeaning of you? Steffi comes in here and says, "She doesn't make any mistakes. She just gets balls back," as though that weren't the idea of the game. You are doing other things out there: you have a forehand slice, you're doing a few things. Do you have pride that it's not just the fact that you're running all day long and finally somebody else gets bored and misses the shot? Do you have pride you are doing something? AMANDA: I think that's probably what wins me a lot of matches, because I think my game is a little bit deceiving. I think I'd -- I would like people to think that I'm giving them a bad shot, I'm giving them a shot they should make a winner of, and that's how they normally miss. In a way, I think that's probably good. I think my shots are heavy, like I said, maybe a little bit deceiving. Whatever they want to think is fine. Q. Can you just talk about playing Iva next. AMANDA: Sure. I've watched her. I watched her play a little bit today, obviously, because I was waiting for the match. I think she's a tremendous competitor. I have a lot of respect for that. I hope to play a tough match against her. I anticipate it to be a tough match. Q. You seem to enjoy a lot when you are playing. You have very enthusiastic? AMANDA: When I'm playing, thanks. That's a compliment. I like to be enthusiastic about my game. Sometimes I'm very focused and don't show too much emotion, but I really do enjoy it. Q. Amanda, Steffi seems to think that you haven't got the game to win here this year. Having watched Iva play this morning, do you think anybody is going to stop you? AMANDA: That's my goal, to make them stop me. I think they have to come out and beat me. You know, obviously competition is really, really tough out there. I'm just taking it point by point to see what happens. Q. Could you just comment on the conditions out there? Obviously the match went back and forth a number of times. How might that have affected the match? AMANDA: It was really, really tough to play, extremely windy. Obviously, the courts have been really dry, so a lot of sand. A lot of times it was tough to see. I think maybe the wind helped me a little bit today. I think I played pretty well under the circumstances. I just feel fortunate to come out of it. Q. Amanda, is this the kind of day where it would help to have very quick feet, to make last-second adjustments on the court because of the wind? AMANDA: Probably. But, you know, at the same time, I was up against an opponent who has really good hands. I think you have to have really good hands to adapt, really adjust at the last minute. It was definitely tough. I think both our games we play a lot of spin, and we really had to adjust a little. It was definitely tough. Q. You've been on a winning streak here for the last few weeks. In some ways, do you agree this is one of the very best wins, this is an extremely experienced claycourt player you beat today? AMANDA: I would probably rank it, you know, way up there. I've never beaten her. I think it was a huge challenge for me. I think I've never even taken a set off her; maybe once before. Again, the match was somehow going like it normally goes. I was extremely happy to have won that. Q. Amanda, having played her ten times and lost every time, when you went into the match today, how did you mentally prepare yourself? Did you really think you could beat her, having lost so many times? AMANDA: Exactly. I knew I had to take a leap of faith and just hope for the best. I started off well, but I felt like I was up against a lot of confidence. Even being up 5-2 in the first - I had a few set points - I think she knew she's always beaten me. She felt really confident. Q. In that first set when you did have set points and ended up losing it, how did you regroup it to come back in the second? What were you trying to do differently and why did you think you fell in that first set after being up? AMANDA: I didn't feel too bad because I felt like she started to play better. On the set points, they were pretty tough conditions, tough points. I didn't feel too bad. Once again, I think mentally I felt like, "Here we go again." I was hoping to at least get a set from her to at least make her think a little bit more. It was really tough. I think I played all right at the beginning of the second, felt good about that, but then just lost it there for a few games. Q. Amanda, I think you were 2-4 down in the second set. Given that previous record you had against her, I was wondering what got you through under those circumstances? AMANDA: I think actually it was 4-1, a few game points as well. You know, I definitely think she let me back into the match. There wasn't a whole lot that I did. She definitely gave me some chances. Q. Amanda, could you just describe your conditioning going into this match? You seem to be in better shape than Conchita. That seemed to be somewhat the difference. What do you do differently to prepare for this tournament? AMANDA: Well, I think the one thing that I've done, I've played a lot of tournaments on the clay. I've always struggled with my movement on the clay. I think that's really paid off. I've been on it probably five weeks already. I think that's definitely helped me. Obviously while I'm playing tournaments, I haven't done as much conditioning as I would have, but I think I'm very, very match fit and match tough. That's really helped me. Q. Amanda, you may play Steffi in the next round. You've had some interesting matches against her already this year. How would you feel about going into another match against her? AMANDA: Obviously I'm very excited to be in the quarterfinals. I have a lot of firsts here, beating Conchita for the first time. I think it's the first time I've reached this round at the French. I'm very excited. It's an opportunity for me. If she's playing well, who knows. It's something I can look forward to. Q. Do you consider yourself fitter than Steffi physically, and that would be the advantage? AMANDA: I'm not sure. I think she's probably gradually played better and better. She's obviously been injured and hasn't been able to play as much as she wanted to. Who knows. I know I can stay out there as long as I have to. I think that's all I'm concerned with. Q. On your day off tomorrow, you'll probably have a hit. Are you the type of player that spends a day off before a big match sitting around thinking about the match or do you want to get your mind completely off of it and do something? If the latter is the case, what would it be that you would do? AMANDA: I think normally I try and think about it the night before so I can dream about it all night, visualize. During the day, I just let my mind go and relax, have an easy hit. Q. In what way did the wind help you today? AMANDA: I think my game plan was to try and switch up my game a little bit, to mix up my game, come in a little if I had to. I think the wind really helped me with that. I think it threw in some unexpected shots. She really didn't know what was coming off my racquet. I think definitely the wind did help me. Q. Amanda, what would you see in those dreams when you're preparing for the match? AMANDA: Do you want me to share that with you (laughter)? What are dreams for? If you lost to somebody ten times in a row, that's all you can depend on. That's basically what they're about. They're just dreams. Q. Do you feel that you're still underestimated a bit by the top players, but now having broken the Top 10 you have a new respect with that in the last month or two? AMANDA: I don't know. I think my main focus is to be, you know, a very, very tough opponent for those people. I think they know that. I think they know I'm never going to give up. That's all I want. If they give me some small opportunity, I'm right there. I think for me that's a very tough opponent. You never know what's going to happen. You know they're not going to give up. I think that's hard to compete against. Q. Your strategy at the end of the third set. It appeared that Conchita was making quite a few errors. Were you trying to keep the ball in play or were you aggressively pursuing the match at that point? AMANDA: I think I was just, you know, continuing what I've been doing. I definitely noticed that she was making a lot more errors. I was just playing my own game, trying to focus really hard, especially in the end when I realized I had the chance to win this.